Q: I have a John Deere 330 diesel garden tractor. I have numerous attachments for it. It has a front loader, 3 point hitch, and more. I also have a power broom that I would like to mount on a different unit as the loader and broom are too inconvenient to continuously switch out. I am curious as to which models will interchange with mine. I understand the 316, 317, 318 models will accommodate my accessories. What other models will? I plan to look for a second unit to mount the broom on and perhaps my tiller as well. What are my options? Do you have any insights on the 330? Anything I can do to increase the hydraulic capacities? Any quirks I should be aware of? A: The garden tractors you can mount the broom are John Deere 120, 140, 300, 312, 314, 316, 317, 318, 322, 330, and 332. 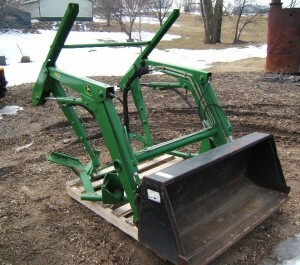 The loader and your 3 point hitch can only be mounted on John Deere 316, 318, 322,330, and 332. The hydraulics on the John Deere 330 garden tractors work fine, if you are running the loader off of the tractor, I would switch the loader over to it’s own pump. The front end loader works much faster and better if you get a big enough pump. powered from the front PTO? Where would one mount such an animal? What should I be looking for in a pump? How big is big enough and what kind of performance could I expect? Currently my unit struggles with about 300 lbs, but the bucket capacity is slightly larger, when I switch to the 2′ forks (my own design) I would like the ability to occasionally lift more than that. Increased speed would be a much welcome side effect if possible. minute pump will make things work pretty good. Myself, I put on a 22 gallon per minute pump on the John Deere 318 – the Bird, but you do not have to go that far. On most front end loaders there is a by pass valve on the 2 lever valve that allow you to adjust the lifting capacity of your loader. Of course in doing so you will have to add even more weight yet to the rear of the garden tractor.